In September 2012 I completed my first Olympic distance triathlon. 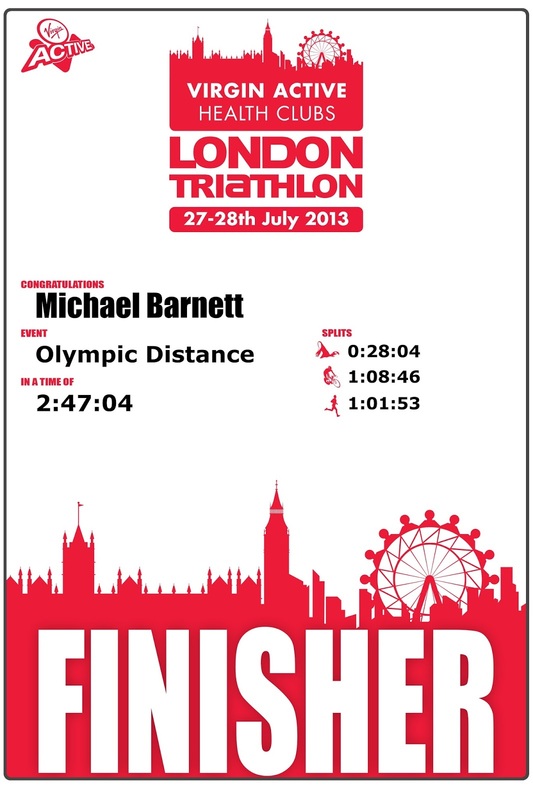 This triathlon was my A race for 2012 and I had raised over £1000 for charity in the run up to this race. The day of the race arrived and I had set myself a target of completing the event in 3 hours and 30 minutes. 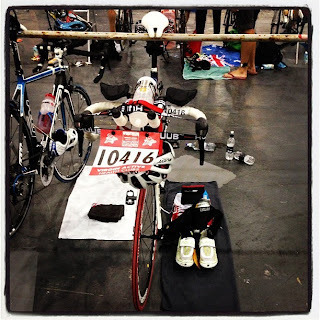 The weather made this one of the toughest days of my (short) triathlon career. There was rain of (and I am not over exaggerating) biblical proportions. I was thrilled to get to the finish line as there were a lot of people who were less fortunate. Even though I got to the finish line, I missed out on my target. My finish time was 03:32:57. Those precious 2 minutes and 57 seconds left me with a nagging itch. Fast forward 10 months and this itch needed to be scratched. Had I completed the race in under 03:30. 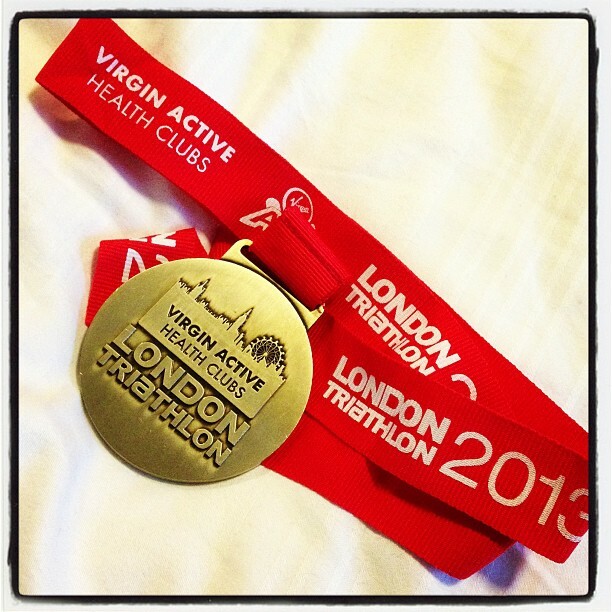 I really do doubt whether I would have entered London again especially with it being only 3 weeks after Outlaw. But we are where we are. I had an itch and it needed scratching. I realised that I am so muich stronger than I was in 2012 and subsequently lowered my target finish time. Given how well things have been going this year I predicted it would be possible for me to complete an Olympic distance triahtlon in under 3 hours. All of which I believed would be achievable. So there was my plan. Training for the event was hit and miss as I struggled to find my mojo after Outlaw. 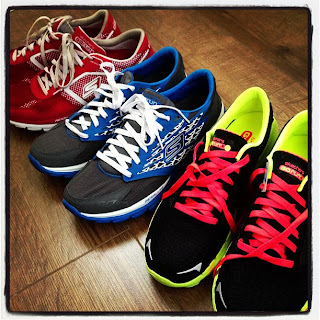 I had read about "Ironman Blues" but thought that they wouldn't affect me as I had a race in three weeks. I thought that having a target would reinvigour my training and act as a kick up the arse. I was wrong. The week after Outlaw I was in such a terrible grump and could not find the motivation to train. It got to the Friday after Outlaw and my wife joked "welcome back to the World", I think I must have been a little distant. 4 swim sessions, 2 bike rides and 7 runs. 3 swim sessions, 1 bike ride and 5 runs. The distances I planned to train for and what I managed differed greatly as well. I didn't manage one 10km run between Outlaw and London despite having 4 planned. The Outlaw really took it out of me. This was not the best preparation for London but as I said earlier we are where we are. The other challenge I faced between Outlaw and London was teaching my body to go faster for shorter periods. In the previous 20 weeks I had been teaching my body to go long and slow and now I wanted it to go short(er) and fast. I had a 1500m TT in the swimming pool 4 days after Outlaw and was elated when I set a new PB of 24:51 smashing my old PB by 01:22. I entered a 5km run in Doncaster on the 17th July. This would be my first ever appearance at a running race. Again I was elated that I managed to set a PB of 26:48 for 5km besting my old PB by 44 seconds. Maybe this short and fast thing isn't that hard after all? Sorry for digressing but I have a lot to catch up on. Me and the wife travelled to London on the Friday. I have no idea what we did all day but we didn't arrive at the hotel until after 6pm. Needless to say after checking in and sorting something for tea, there wasn't much else to do so we got an early night. On the Saturday we graced the expo with our presence. I absolutely love triathlon expos and I'm sure I wander round with my mouth agape wishing I had a limitless pot of money. Alas I don't. I decided to buy some Skechers trainers as a birthday present of my Grandma. After 12 failed attempts to find a trainer which doesn't cause me blisters it turns out that the Skechers Go Run blister me less than any other trainer when combined with Karrimor run socks and Chamois Buttr. Its a palava but it works for me for now. My wife also persuaded me to buy another Compressport Triathlon T Shirt as the white one I bought for the Outlaw is stained with suncream so I opted for black. After the expo we went to Hamleys. I've never been before but was amazed at how expansive it was. 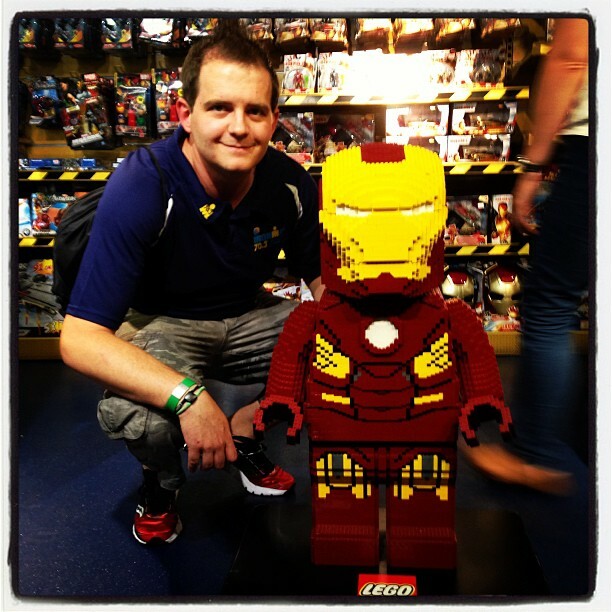 I even bumped into a fictional Ironman who was made of Lego. My wife thought I would spend a fortune in Hamleys but I left empty handed. Race day arrived and I was pleased to see the weather was the polar opposite of 2012. We had clear skies which was a huge releif. Like in 2012 I was in the penultimate wave of the day and would be leaving at 14:55. My Dad made the trip down to watch me race and arrived at 11:50 which meant that I got to specd some time with him before my race. I racked my bike and this went a lot better than last year without any panicking. After I had racked my bike I was sat minding my own business waiting to race when the Team Dillon Coaching team sat near me and on their table were Michelle Dillon (two time Olympic triathlete), Stu Hayes (one time Olympic triathlete), Emma Pallant (BTF Super Series winner for 2013) and Jane Hansom. I know Jane from the RG Active training camp in Mallorca and she came to wish me luck. Jane had raced in the elite womens race, I was thriled she did as she is such a superb athlete who juggles running a company with triathlon training. It was also pleasing to see Emma Pallant eating the same as me for lunch. After lunch I got changed into my wetsuit. I love wearing my wetsuit because as soon as I put it on I know I am in the zone as swimming is my thing. I made my way to the swim assembly point and tried to manouvre my way to the front. I failed miserably and missed the split point between the waves. I really wanted to be in wave one so I had clear water for the swim. I managed to get to the front of the second wave for the start and was amazed by how congested it was. Outlaw wasn't as bad as this. I had no chance of getting clear water without sprinting from the start. I hate doing this as despite being a good swimmer, I do not know my limits with speed and think I can swim like Michael Phelps which I can for about 20 metres and then I die a horrible death. The hooter went and we were off. I was quicker away than most and after 50m I had clear water. Yes I thought. After 300m however the elation turned to despair as I had already made up the 2 minute advantage that wave 1 had on me and was now swimming past the slower swimmers from that wave. After a bit of weaving I was starting to overtake those swimmers. By now we were nearly at the turn point.I had an amazing first 90 degree turn and managed to pick a line which didn't involve being kicked or punched. It was bedlam but I came through unscathed. I have never been involved in such a physical swim. Again I got through the second 90 degree turn unscathed and made the turn back to Excel. The swim back was a lot harder than the swim out as were now swimming into the wind. All was going swimmingly (excuse the pun) until from nowhere a swimmer cut across me and kicked me squarely in the face dislodging my goggles. Had this occured last year I would have said that my swimming was the problem but my sighting and swimming in straight lines has improved no end this year so I know I was swimming straight. After stopping to check my nose wasn't bleeding or broken and emptying my goggles of water, I set off again. I picked off more swimmers and thought that the swim back was a lot longer than the swim out. I am unsure if this was due to the wind or my mind playing tricks on me. I made the turn for home and picked off two more swimmers on the home straight. I got to my feet without the unsteadyness I have become accustomed to and the helpers unzipped my suit. I jogged along the dock removing my wetsuit. I had to stop to remove the legs but during this brief respite I managed to look at my Garmin and it read 28 minutes something. Not quite what I had hoped for but still a three minute improvement on last year. My actual swim time was 28:04. I knew to take it steady up the stairs as they would be slippy. I made my way to my bike, dried my feet, put on my socks, shoes, helmet and number belt. I then retrieved my bike and jogged through the transition zone. If you ever race the London triathlon be warned the transition zone is massive. My T1 time was 05:15 which I was pleased with. I put the hammer down as soon as I got on the bike, I knew I managed the same route in 01:25 last year but this time I did not have torrential rain to contend with. I wanted to see what I was capable of. The bike route is amazing as you get to ride through the Limehouse Link tunnel. 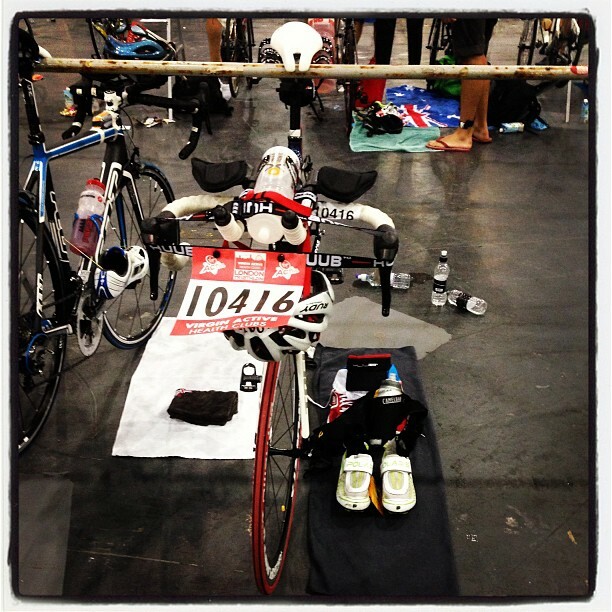 The route is a two lap ride to Tower Bridge and past the Excel. I was thrilled that I completed the first lap in 33 minutes. Jeez I was flying. I kept pushing through the second lap. I noticed a fellow RG Active athlete who I know through Twitter who is good at cycling and noticed that our gap was staying constant at each turn point. Like I said flying. It also really helped having support this year. Because of the rain last year I didn't see my wife on the bike but this time I heard her below "Go on Michael" twice on each lap and this gave me a huge lift. I tootled back into the Excel, Due to some rain in the early afternoon you had to dismount walk around a corner and then remount to climb the final hill for safety reasons. My time 01:08:48 which was 17 minutes quicker than 2012. 17 minutes. WOW! I dropped my bike off, threw on my trainers, bottle belt and visor. I also put on my charity vest. Because I enquired about completing the London Marathon for Roy Castle Lung Foundation and am an ex smoker they sent me a running vest to run the London Triathlon in. I set off on the run. The run route had slightly altered since 2012. In 2012 it was 4 laps of 2.5km, whereas in 2013 it was three laps of 3.3km. As soon as I exited Excel the heat hit me full on. Wow it was hot on the run course. Great heat and running, this was going to be interesting. Being slightly overweight I fare better running in cooler temperatures. It is the same for everyone though so time to knuckle down. I felt cramp brewing in both my quads. I think this was as a result of the hot temperatures and how hard I worked on the bike. I had tried to counteract cramp in advance of it occurring by drinking lots of electrolyte drinks on Saturday evening. This obviously didn't work. On my way back to Excel on the first lap (so about 2.4km into my 10km run), I stopped to stretch out my quads to fend off the cramp. Oh balls full on cramp had hit. After I stretched it, I set off hobbling. The next 7.6km were a combination of running and walking but more time was spent running. I saw my Dad and Wife on every lap and it gave me a lift. I made sure I ran through the charity supporter zone where all the charities support the athletes. I also made sure I ran through the Excel. At the end of lap one, the RG Active athlete mentioned before caught me up. I've been tweeting with @Monkeymax3 for over a year as we were in the same wave last year but we had never really met. We shook hands and he let me stay ahead through the completion of the first lap, which was a nice gesture. I couldn't keep up with his pace and dropped back. We high fived at the turn points on lap2 two and three and this also gave me a lift. One of the nicest things about the run was the charity supporter zone, because I was the only person running for Roy Castle, I got mentioned by the announcer on every lap and this made me feel like a superhero. It was so humbling. On my last lap, I clapped all the supporters on both of my trips through the charity supporter zone, it was the least I could do to thank them for their support. At the halfway point of lap three, I reckoned I could just sneak under the hour for the run if I managed to run the last half lap. I gave it my all but tired myself out. I left enough in the tank for a sprint finish though and as soon as I rounded the last corner I broke into a sprint. This cuased the crowd in Excel to clap the boards and yell "SPRINT, SPRINT, SPRINT" which was so uplifting. I crossed the line and stopped my Garmin. The time was 02:47. WOW WOW WOW WOW WOW. I had hoped to sneak under the 3 hour mark but I smashed it. This was more than I could have hoped for and I had finally done myself justice on this course. The improvement was a staggering 45 minutes, this still blows my mind. I told my old coach how much I had improved by and he was lost for words. He said most people improve by two to three minutes, not 45. This shows how much I have improved in the space of ten months. The run time was 01:01:53 which was an 18 minutes improvement on 2012. I am still on cloud nine with what I achieved. I have silenced my London demons.Will I race this course again. I probably will but not for couple of years. Who knows 02:30 may be on the cards for next time. I collected my shiny from the volunteers and was really impressed by the design this year. I even posed for a photo on the podium. A comparison between 2012 and 2013, I am so much stronger this year. Thanks for reading. I hope you have enjoyed this journey but don't worry it isn't over yet.